A shrinking pickguard cracks the guitar top! In Dan Erlewine's shop: This Martin D-35 has a cracked top due to the pull of a shrinking plastic pickguard. Dan fixes the problem and shows how to keep this happening from happening again. 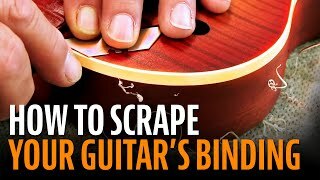 Dan Erlewine's got a neat trick for a mandolin repair, and he makes his pitch to get us all to join the hide glue club! 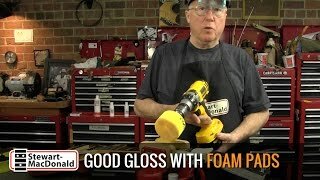 Instructions for building a wood platform to securely mount the buffing arbor and motor onto a bench or stand. 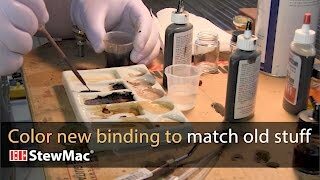 A demonstration of the proper technique for repairing a nitrocellulose lacquer finish using the Behlen Lacquer Repair Kit. Tips and instructions for achieving a professional finish with the ColorTone Aerosol Finishing Kit. Application instructions for ColorTone Aerosol Guitar Lacquers. 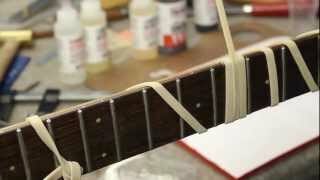 Directions for using ColorTone Fretboard Finishing Oil. Directions for using ColorTone Liquid Pigments for Lacquer. Directions for using ColorTone Liquid Pigments for Waterbase Lacquer. Directions for using ColorTone Liquid Stains. Directions for using ColorTone Polishing Compounds and Swirl Remover. Application instructions and a finishing schedule for ColorTone Tinted Aerosol Guitar Lacquers. Directions for using ColorTone Waterbase Lacquer. Directions for using ColorTone Waterbase Retarder. Directions for using ColorTone Waterbase Sanding Sealer. An overview of the basics of buffing with compounds. Part 6: Dan Erlewine uses sandpaper and polishing compounds to achieve a PRS-style finish using liquid stains and aerosol lacquer. Part 3: Dan Erlewine shows how to achieve a PRS-style finish using liquid stains and aerosol lacquer. Part 4: Dan Erlewine shows how to build sealer coats and drop-fill any imperfections that may occur for this PRS-style finish using aerosol lacquer. Part 2: Dan Erlewine shows how to apply the stain for a PRS-style finish with aerosol lacquer. Part 5: Dan Erlewine sprays the clear topcoats to achieve a PRS-style finish using liquid stains and aerosol lacquer. Part 1: Dan Erlewine shows how to prepare the wood for a PRS-style finish with stains and aerosol lacquer. Somebody's wrung this guitar's neck with years of string bending -- the wood is gone from the edge of the fingerboard. The customer doesn't want a new neck, so Dan Erlewine improvises a great solution. 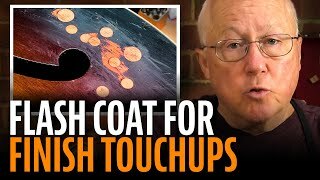 This issue of Trade Secrets is a video: Dan Erlewine demos three of his favorite finish repair tips: 1. Super glue drop fills. 2. Frank Ford's razor blade trick. 3. Strip-sanding with fingertip pressure. Erick Coleman shows why black fingerboard stain is a standard item in any guitarmaker's shop, including the big name builders. This week's issue is about instrument finishing: a good tip about setting up new buffing wheels, and an idea to save space in your workshop. After an unsuccessful finish repair, this guitar’s owner sent it to Dan Erlewine to fix the damage. Using a neat trick he learned from Erick Coleman, Dan builds the finish fast with films of dried lacquer. Then he polishes it with a hand drill and foam pads. After gluing a broken peghead, Dan Erlewine still a finish repair to do. In this Trade Secret, he shows you how to save time by using amber super glue and his favorite razor blade trick. Erick Coleman's buddy wanted a guitar just like the one he saw on Soul Train in the 1970s. Curing his Boogie Fever required a neck transplant, but Fender's Micro-Tilt neck adjustment makes that tricky. Here's how to do it. 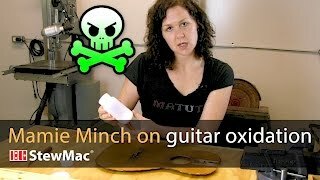 How to clean a guitar that REALLY needs it! Rock's a dirty business, but somebody's got to do it: Dan Erlewine cleans up a Les Paul that hasn't had a bath in four years -- and 650 gigs! A small finishing job like this is easy. After the bridge popped off this classical guitar, Dan Erlewine replaced it with a new one. 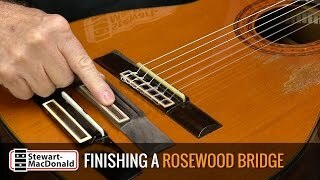 In this short video, he shows how simple it was to put a finish on the new bridge before gluing it on. How to use spray equipment to get the best possible coverage. Working on an aged Les Paul, Erick Coleman has to sand part of the yellowed binding. The sanded spots are a glaring white mismatch. Erick makes turns the repair invisible with a little ColorTone spray and stain. Erick Coleman uses a hammer and X-Acto knife before filing. 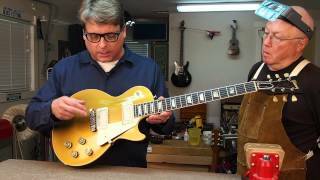 On this video he also talks with Dan Erlewine about how a 1954 Les Paul went from Bondo Mess to Relic Goldtop, with multiple luthiers contributing to its restoration. Erick Coleman uses tinted aerosols to recreate a vintage Strat 2-tone 'burst. As Dan Erlewine was packing a customer's Les Paul for shipment, he noticed that somebody in his shop had scratched the top! Time for some fast finish fixing -- here's how he made the scratch go away. Dan Erlewine's cooking with baking soda and ColorTone stains -- fixing a hole in his granddaughter's birthday present. This week, Dan Erlewine reveals the seven-pin bridge that's hidden by Robert Johnson's hand in that most-famous photo of the King of the Delta Blues. Chemicals that add or remove years: Mamie Minch shows how she fades away old brown oxidation ù or adds it, to make a new patch of spruce match the surrounding wood. West/East concept guitar: Michihiro Matsuda taught guitar design at Galloup Guitars' Northwoods Guitar Seminar in August. 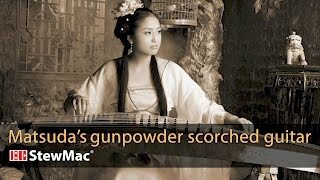 We were lucky enough to get this video as Bryan Galloup interviewed Michi about his unique gunpowder scorching. Micro finishing papers cut more quickly and smoothly than other finishing papers, leaving no scratches when used properly. This week, somebody's attempt to fix a 1960 Les Paul is an example of what not to do. Dan Erlewine tries an experiment that saves this smashed-up guitar's finish: he creates cherry-red epoxy. A step-by-step flow chart of nitrocellulose finishing. Dan Erlewine's working on a black lucite Dan Armstrong bass -- one of only eight that Ampeg ever made. The fretboard has a nasty crunch. Step-by-step, Dan details how he does this tricky fix. Dan Erlewine shows how he makes a new finish repair on a 1956 Strat look as old as the original finish all around it. This bass from the early '70s is in great shape except for a gaptoothed peghead inlay. 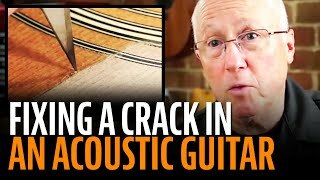 Erick Coleman shows how to quickly replace a missing inlay, including coloring the new work to match the old. An introduction to spray guns, including use, care, and troubleshooting. Installation and safety instructions for the Buffing Arbor System. 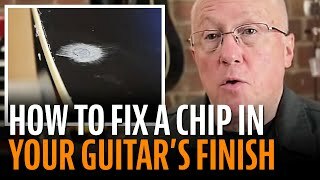 This week's subject is one that comes up a lot: how to quickly repair chips in an instrument finish. Directions for using Target Waterbase Lacquer. Dan Erlewine learned this trick at Gibson’s factory back in the 60s: Three jars, three mixes of lacquer and thinner always ready for “flash coat” touch-up spraying. This finish repair hides a batch of punctures in a Gibson archtop. When a pedestal buffer can't accommodate the shape of Junior Brown's famous Guit-Steels, Michael Stevens finds that a simple foam buffer does a great job! Visiting Frank Ford, the King of Shop Tips! 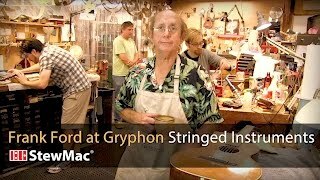 Frank Ford is the man behind frets.com, one of the richest sources of lutherie tips to be found anywhere. He's a skilled luthier, machinist and inventor. Spend a few minutes in Frank's shop at Gryphon Instruments, and you'll come away smarter! A step-by-step flow chart of water based finishing. 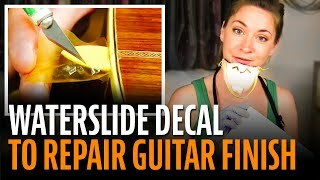 Waterslide decal to repair a guitar finish! Chelsea Clark shows Dan Erlewine a clever trick: turning our aerosol guitar finish into a waterslide decal. This makes a great spot repair on this 25-year-old StewMac Dreadnought. Which sandpaper to use for instrument work? Dan Erlewine looks at specialty papers for lutherie, and comes up with a handful of tips for tricky sanding. Which super glue to use: thin, medium or thick? Dan Erlewine uses photo examples to show when to choose thin, medium or thick super glue for instrument work. Erick Coleman's neighbor has put a chip in his big brother's guitar. It needs to be repaired invisibly, and fast! Touch-up markers do the trick.